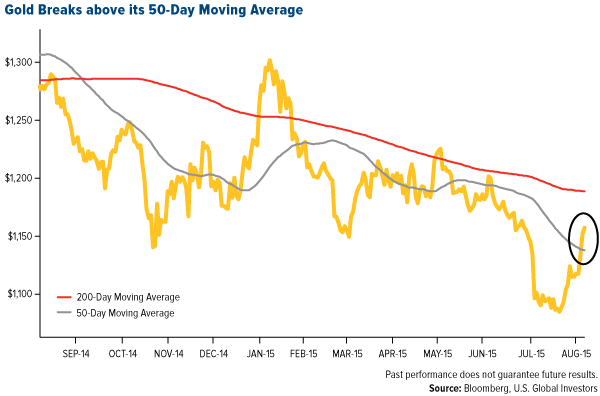 Gold last week broke above its 50-day moving average as a fresh round of negative news from around the globe rekindled investors’ interest in the yellow metal as a safe haven. The Fear Trade, it seems, is in full force. China, the world’s second-largest economy, continues to slow. Its preliminary purchasing managers’ index (PMI) reading, released on Friday, came in at 47.8, a 77-month low. 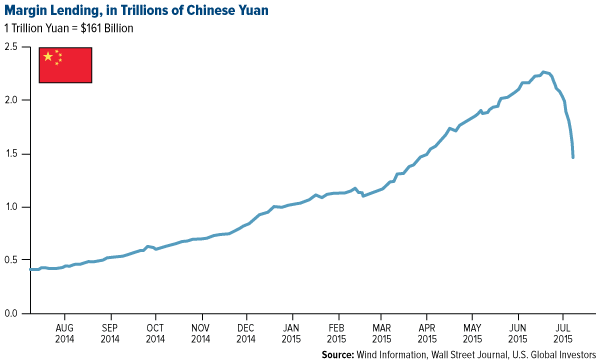 This follows China’s decision to devalue its currency, the renminbi, close to 2 percent. For the first time in a year, the Shanghai Composite Index fell below its 200-day moving average. Crude oil is on an eight-week losing streak, the longest in 29 years. West Texas Intermediate (WTI) slipped below $40 per barrel in intraday trading Friday, the first time it’s done so since 2009. U.S. stocks are undergoing an ugly selloff. They just had their worst week since September 2011 and are on track to post their worst month since May 2012. The Dow Jones Industrial Average, down 10 percent since its all-time high, is nearing correction territory. All 10 S&P 500 Index sectors were off last week. We can also add to this list the high levels of margin lending on the New York Stock Exchange (NYSE) right now. At the end of every month, the exchange discloses margin amounts, and it appears that everyone is leveraged. Real margin debt growth since 1995 is twice as much as real S&P 500 growth. We saw a huge bull market from 2009 to 2015 on the S&P 500 when it went to around 2,080 from 666. That market is really mature. One number that scares me is the high margin debt on NYSE. 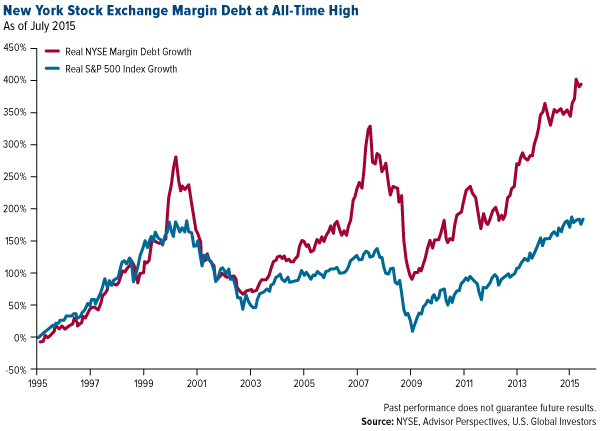 When the big market crash happened in 1987, we saw $38 billion in margin debt, but as of June 2015, NYSE margin debt was more than $504 billion. Everyone is dancing until the music stops. So I’m shorting the S&P 500, while building my basket of different precious metals producers. Should the $504 billion—an all-time high, by the way—worry us, as Ringler suggests? Maybe, maybe not. It’s worth remembering, though, that high margin lending in China greatly contributed to the Shanghai Stock Exchange’s 30-percent correction just a month ago. 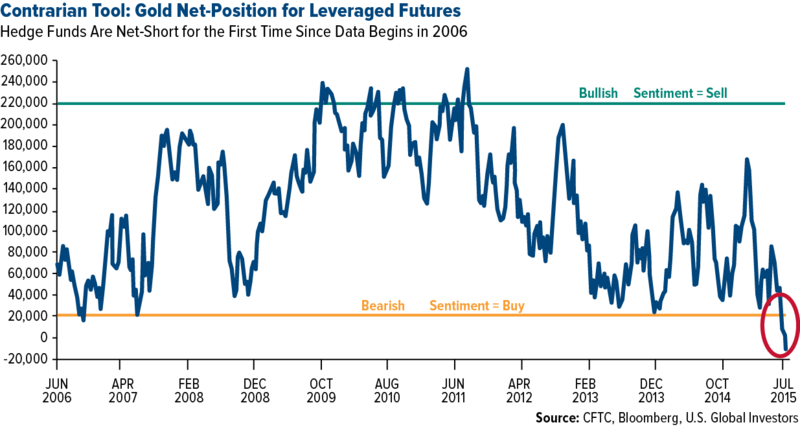 Earlier this month I shared with you that hedge funds are net short gold for the first time since U.S. Commodity Futures Trading Commission data began in 2006. Being short has become a very crowded trade, and many contrarian investors have seized upon this bearishness to add to their gold exposure. American Eagle gold coin sales rose an impressive 124 percent in July month-over-month. Last week, famed hedge fund manager Stanley Druckenmiller plunked down more than $323 million of his own money into a gold ETF, according to second-quarter regulatory filings. Druckenmiller is the guy who consistently delivered 30 percent on an average annual basis between 1986 and 2010, the year he closed his fund to investors. He’s also responsible for making the call to short the British pound in 1992, which “broke the bank of England” because it forced the British government to devalue and withdraw the currency from the European Exchange Rate Mechanism (ERM). And now he’s made a huge bet on gold. The $323-million investment, in fact, is the largest position in his family fund. Demand among global central banks and retail buyers has also heated up. As I told Daniela Cambone in last week’s Gold Game Film, the Chinese government is now reporting monthly on its gold consumption to offer greater transparency and convince the International Monetary Fund (IMF) that the renminbi should be included as part of the special drawing rights. Last month, the Asian country purchased 54 million ounces. And in the first half of the year, demand in Germany, the third-largest gold market behind China and India, increased 50 percent over the same period in 2014. 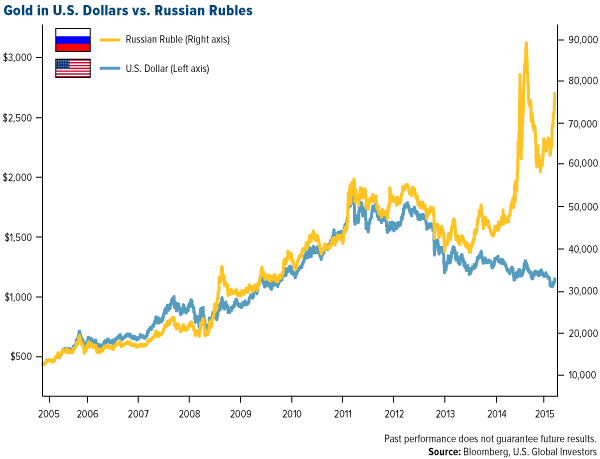 The Russian ruble, meanwhile, has lost nearly 50 percent of its purchasing power from 12 months ago, following its invasion of Ukraine and the drop in oil prices. Over the same period, gold has risen about 54 percent. It shows that when a currency loses value and falls out of favor, gold has tended to benefit as investors seek real assets. Gold prices have then been able to soar, just as we saw in the months following the financial crisis, eventually reaching an all-time high of $1,921 per ounce in September 2011. Remember, Druckenmiller just invested heavily into gold. Prudent investors such as him understand the dynamic between fiat currencies and gold, and they adjust their funds accordingly. Does he predict something happening to the U.S. dollar that might benefit gold? Druckenmiller might have 20 percent allocated to gold, but it’s advisable to have closer to 10 percent—5 percent in gold stocks, 5 percent in bullion, then rebalance every year. This should be strongly considered whether the economy is soaring or struggling. I invite you to head over to Kitco and compare for yourself the price of gold in U.S. dollars to other world currencies. Previous Article What now for markets and gold?